Out of the 37 nieces and nephews I have, not one of them is born in the month of June, crazy eh? So no n/n's cookie post this month. So today I thought I would share what the kids and I did, we made homemade fruit popsicles. Our local Winco was having a big sale on fruits so I bought a bunch and we have been enjoying fresh berries and fruits all week. 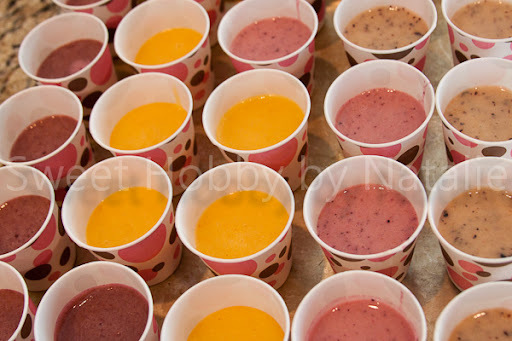 But I was afraid that some of the fruit was going to go bad, I know I could have just froze them but with the summer heat headed our way I figured the kids and I could make healthier, tasty versions of the frozen treat for the hot summer days. I also strained the berry flavored ones so that my kids would not complain about the seeds. Put all ingredients in blender and blend until smooth. Pour into Popsicle molds or use small paper cups like Dixie, put in your stick and freeze for at least 3 hours. Store in an freezer bag or airtight container. Put all ingredients in blender and blend until smooth. 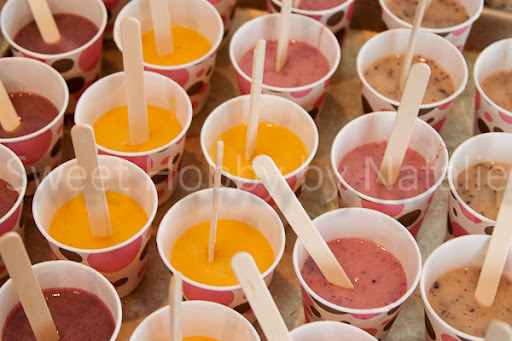 Pour into popcicle molds or use small paper cups like Dixie, put in your stick and freeze for at least 3 hours. Store in an freezer bag or airtight container. You could also use vanilla powder and do all kinds of variations but I prefer the chocolate over the vanilla. So if you want to make a healthier version of this frozen treat this summer you should! It's also a great activity to do with your kids, my son loved helping count out the cups and putting the sticks in.